FINALLY got my hands on this full floral look! I fell head over heels in love with it when I got to see a preview a while ago and have been on a mad hunt for it since. Managed to snag the pants 2 weeks ago but the jacket was nowhere to be seen, until the other day when my friend Sania gave it to me as a belated birthday gift!! Huge thanks babe, I love it! H&M jacket + pants. ZARA knit. WERELSE FOR MANGO TOUCH heels. AMERICAN APPAREL bag. CÉLINE sunglasses. This entry was posted in Outfit and tagged celine sunglasses, fashion blog, floral suit, hm flower pants, Outfit by Carolina Engman. Bookmark the permalink. This bag is so awesome! Great pictures!!!!!! I love this new trend so so much! Is it H&M Trend? I didn’t see it yet in the stores..
the floral jacket and pants are amazing, and you look fab as per se! i’m in love with this outfit! everything is so perfect!! Amazing look !!! love it !! so, you have to thank your friend forever, huh? hehe, great styling! Amazing outfit. Wish i had the balls to wear something like this. Simply incredible, i have no words! Congratulations! I love this clothes from H&M <33. Great outfit! Nice outfit! Live the clutch and shoes! I am happy to stop by, you are doing great job! omg, this is such a gorgeous outfit! your look amazing! Nice ! i love that suit ! This outfit from H&M is so cool! I have had my eyes on it for a while too! Oh God! Seriously like a few minutes ago I decided I gotta buy those H&M pants and now I’m looking at your new outfit… it’s amazing! Totally love it! omg, I wore those pants a few days ago for a outfit post. Love the way you are wearing it! Great outfit and…. Love your shoes!! LOVE THE FLORAL PATTERN !!! The gradient effect of the jacket and those lucite heels are totally rad. You look amazing as always, Carolina! i love it! that whole ensemble, especially the werelse heels, are perfect! Very brave wearing a full print ensemble! I love it! Loving this! Dip dye plus florals – totally inspired. This is amaaaziiinngg!! So beautiful!! That ourfit is outstanding! You look gorgeous! this is such a perfect double floral outfit! the yellow heels and clutch work so good together! Älskar den här outfiten! Sjukt grym! wow!!!!!!!! you look stunning :D! Very beautiful outfit… – love the print..
U look amazing, love the outfit! Great floral look, I liked how it had a blend of yellow in the floral print! gorgeous outfit..i totally love it! stunning total floral, love the pop of yellow! Wow, I love it. I’m obsessed with it! I love it. I want to get a matching suit and this floral one would be awesome!!! Love that look! Nice shoes! wow, that is an ugly combination. OMG! In love with the two H&M pieces together. Such a cool gift ! Looove this!I was in the hunt,too,but didn’t buy it.I found the jacket,but didn’t want it without the pants.Now I’m a little bit sorry I didn’t buy it:) Love how you combined everything perfectly! need. these. pants. LOVE the look! This is such a gorgeous outfit! You look stunning! Love this outfit! <3, you look amazing!! Summer is coming! Great flower print outfit! Amazing suit! Looks great on you! Love the outfit. Florals are one of my favorite trends this season. Sweet! I love clutch especially! I love that floral suit. Looks amazing with those killer heels. Love! Fabulous suit! Love the pops of yellow with black and white. Love this all floral suit look, it looks slightly vintage, silghtly 90s and slightly modern (only thanks to the amazing accessories though). Love love love your Mango touch shoes!!!!! I love it Carolina & I’m definitely buying those shoes when they launch! gorgeous look! love that jacket! this is such an amazing outfit!! I like the suit, but it’s a pity that every blogger has it now. But it suits you well! Love the outfit! Floral prints always make me happy for some reason. Especially love the retro sunglasses and the bright yellow clutch. A wonderful spring look! The bag and pumps are perfect accessories for this fun outfit. Makes me think about going out to get something floral! omigosh it’s perfect! i love your sunglasses, too. The first moment when i see the pic i think is burn it in yellow…jajaja…but the tocuh of yellow in Black and White Outfit is amazing…Great Caro. You look gorgeous on that floral prints…Perfect for summer! Whoot! whoot! What a lovely clutch. Really like yellow for spring! Floral + lemon yellow accents = perfection! Beautiful combo! And yellow is for sure a summer hit!Love your clutch! This is amazing! I love all the yellow touches. And of course your shoes are fantastic! Love the floral prints that everyone has been rocking! Especially this one, I like the yellow gradient fade! Love the sunglasses and the suit!!!! This is so you! Perfectly styled! And the shoes, oh i just want them as well!! This is a good way of being mad! I love the floral look as well! I’m having a hard time convincing my boyfriend to get used to me following this new trend, but he’ll get used soon, as I simply LOVE IT!! I just bought the same set on hm.com, with a voucher that I got at missisidor.se. those heels are absolutely gorgeous !! I love the contrast of the B/W with the yellow. And I’ve definetely fall in love with that shoes!! When will them be available in stores?? Love the complete floral look, that h&m suit is gorgeous! This is a lovely look! Great mix of colour and patterns! SHUT UP thats from H&M I gotta go to H&M after work now ! Love your outfit and the HEELS !!! u look stunning! I have the same bag, love it! I love all the floral! So gorgeous! This is an amazing look, everything is styled perfectly! i LOVE that suit! you look amazing. the ombre detail is so unexpected and it work so well! LOVE IT! Never seen this floral neon jacket before! would love to see it paired with a mini. Love love love this look!!! Obsessed!! I adore matching pant and blazer outfits! Looks so good on you! Very nice pattern! I love the yellow one between black ones!! Lovely [and funny]! It’s very lovely, kudos to your friend for gifting you the jacket. What neat pants and jacket! Love the funky shoes! Crazy outfit, but you pull it off flawlessly. We seriously adore this look, such a unique approach to florals. You always look great as usual. We love it. You look gorgeous! Amazing outfit! very cute outfit – you look gorgeous!! I love the floral suit! It looks amazing on you! those heels are insane! loved themmmm. Love the head to toe look and the pop of yellow, great! Love this floral outfit and the yellow oversized clutch! An outfit like this is hard to pull off – but you wear it wonderfully! 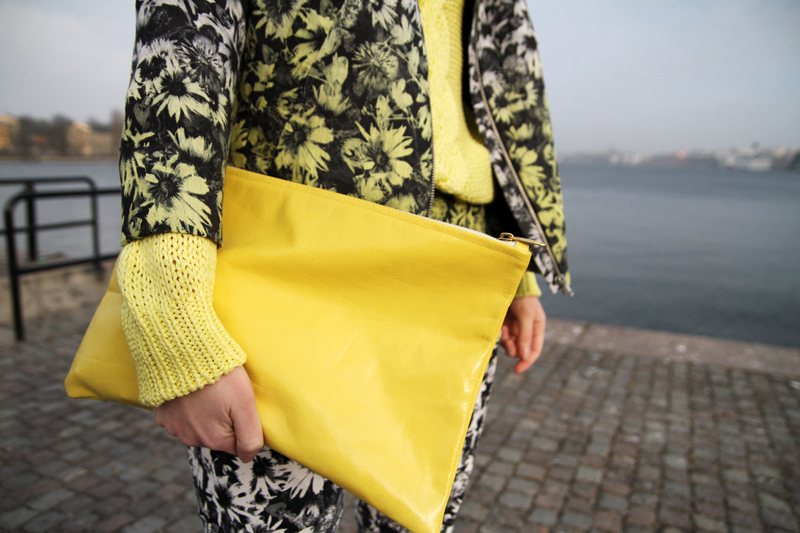 I love the yellow knit jumper and large yellow clutch – gorgeous for spring! wowww amazing!love the shoes!kiss from italy! Very nice blog an VERY nice sun glasses. ha, love the photo editing. Chic combo with the shoes! that suit is so avant-garde, i love it!